Genealogy became a household term with Alex Haley’s book Roots. Whereas the work of personal historians is not the same as the genealogist; we feel they are a great marriage when creating family histories. In a normal lifespan, we are familiar with two generations below us with our children and grandchildren, and two generations above us with our parents and grandparents. Earlier ancestors may only be familiar to us in stories that have been passed down through the ages. Those stories lose their detail over time—names, places and dates fade along with the storyteller’s recollections. That’s when genealogical research combined with social and historical research give those stories renewed life by adding in lost details. We help clients with this research or validate research that the family may have already gathered. We also provide supplemental materials that are often used in sidebars. This usually illustrates the environment or explains historical events that may be unfamiliar to future readers. 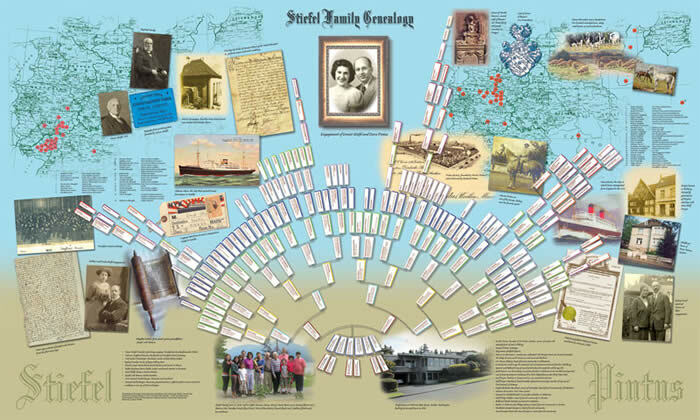 In addition to recording the genealogical data, we have the ability to incorporate family-group-sheet data in attractively designed custom charting. It becomes a visually pleasing component that further enhances the story while clarifying family relationships.